Remember that very first time... that very, very first time you held on tight to your baby and attempt to put him/her in a carrier? How did you feel? Excited? Anxious? Happy?? What about the baby? What type of carrier were you trying to use? Was it a successful first try? Did you feel that your baby is safe? Tell us about your very first babywearing experience and stand a chance to walk away with the prize! 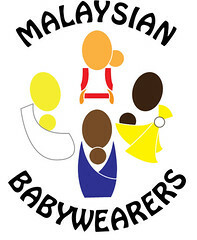 Email your entry to malaysianbabywearers @ gmail.com by 7th November 2010 or email us if you require a mailing address to send it through normal mail. Only a maximum of 2 entries per participant. Multiple entries will be automatically nullified. There is no limit to the number of words to be used/ the length of the entry. Last day for submission of contest entry is 7th November 2010. Results will be posted online (in our blog) on 7th December 2010. Malaysian Babywearers reserves the right to amend the terms and conditions without prior notice. Prize sponsors reserve the right to exchange prizes to one of equivalent value. IBW'10 Contest 5: Photo Contest: Happy Babywearing Family! 'Babywearing' and 'Family'... they come hand in hand... after all, you would not be 'babywearing' if you do not have a family. What we want is your family photos while babywearing... and, shall we say, the more the merrier? Better still, show us Mommy and Daddy babywearing at the same time! You must use only your own picture. This was a fund-raising project organized by Malaysian Babywearers. It was held at the beautiful scenery of KLCC Park on the same day the IBW 2010 Walk was held. For this project, 10 families who had earlier registered with us were invited for a short outdoor photoshoot for a minimal fee of RM20. And in turn, each of the participating family received 10 softcopies of their beautiful family pictures. Here are just some of the lovely pictures. 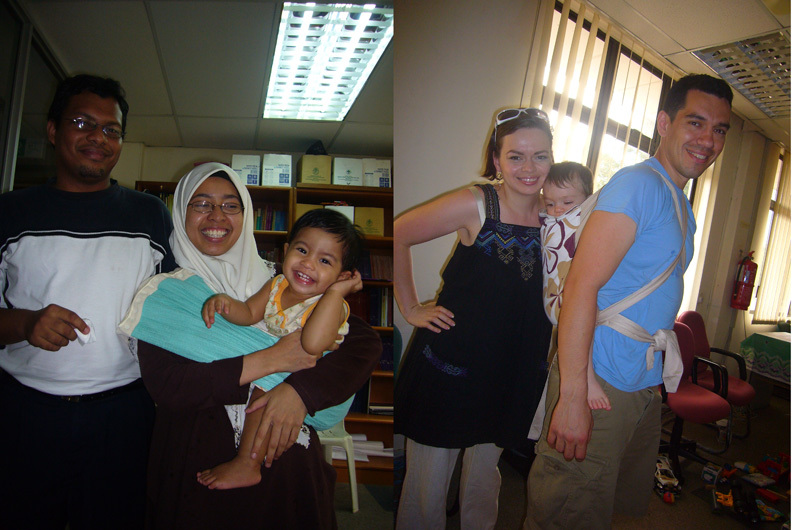 Malaysian Babywearers celebrated IBW 2010 by organizing a walk on 9th October 2010. This year, we decided to reach out further to the public by having the walk at a different location in KL instead of the usual favorite hangout place (currently, The Curve, Mutiara Damansara) - Suria KLCC. The gathering started at 11.00am. More than 30 babywearers turned up. One came all the way from Melaka. Some came even without their babies just to give their support to us! Everyone was excited to begin our public showcase! It was a fine sunny day and everyone was so relieved to finally enter the air-conditioned shopping mall! Our President, Jess, who came all the way from Penang, also showed up with her newborn baby. After the long break from our monthly gatherings due to fasting month and also Hari Raya Aidilfitri, everyone was excited to catch up with each other. For this year's walk we are seeing more Soft Structured Carriers (SSC)! All the SSCs were amazingly beautiful! Some even came in their beautiful D.I.Y. carriers! A sweet babywearing couple holding hands together during the walk. Just look at this new babywearing mama! Thank you to our MBW member, Nita for showing this mama how to use her new ring sling! We certainly attracted a lot of attention there! And finally it's time to wave goodbye to IBW 2010 Walk! We certainly hope we can do this again next year! Happy International Babywearing Week 2010 to all babywearers! Good new from us! We have a new flyer! Help us promote safe babywearing by spreading the flyer to all your families and friends! In PDF file on Google Docs. In JPG on Google Docs. Outer page. Inner page. In JPG on Photobucket. Outer page. Inner page. On Facebook. Outer page. Inner page. 11.00 AM : Gather at KLCC esplanade. 11.30 AM : Group photo at KLCC esplanade. 11.45 AM - 12.30 PM : IBW 2010 Walk proceeds into KLCC mall. Here is the link to our forum discussion forum. Here is the link to our Facebook event invitation. International Babywearing Week is here again! It's here again! The most exciting and fun event of the year in the babywearing world is here again! This year, the theme is no other than "SAFE BABYWEARING: ENJOY THE BENEFITS". It is no news to us at MBW that safe babywearing is important. Indeed, this has been a topic of discussion in our forum since the very day we started! No doubt some could be reading the discussions with fear in mind ("what if I didn't do this right..." but we ensure you, one could still very well enjoy the benefits of babywearing. All we have to do is to be more aware of what we are doing and keep our eyes and hearts open in acquiring the babywearing skills that works for us. And, yes, this can be different for everyone. For those who has been celebrating this event with us for the past years, it's great to have you again. For those who are new to it... be it babywearing or the MBWcommunity, Welcome. We hope you enjoy being with us during this special month of the year and oh yes, this year, we are celebrating it from this very day, 6th October 2010 to 7th November 2010.